Parts currently in production may differ from this image. 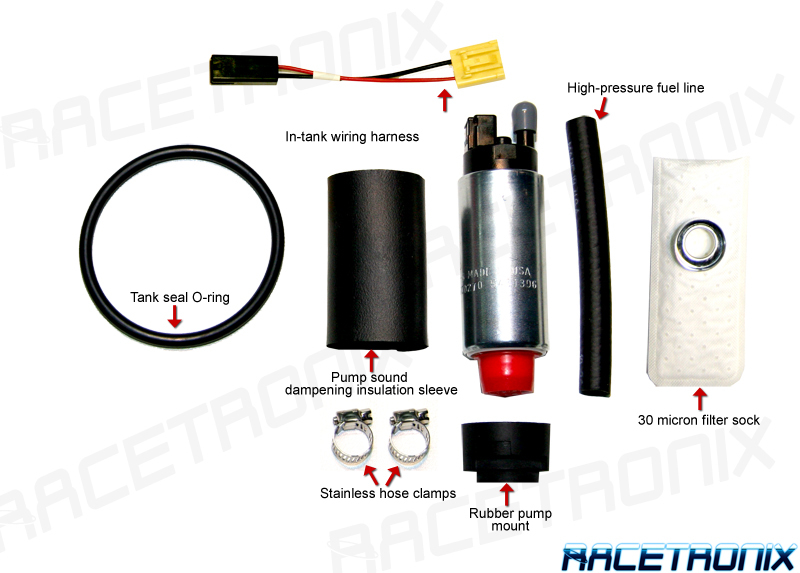 The Racetronix FPA-012 high-performance fuel pump assembly is capable of supporting approximately 550RWHP* @ 13.5V @ 43.5PSI using the factory lines and fuel pressure regulator when installed in combination with our FPWH-012 upgrade harness included in this kit. HP support will vary based on motor B.S.F.C., maximum fuel pressure, target A/F and supply voltage. Please factor in a 20% safety margin between what your motor needs and what your fuel system can supply. This fuel pump kit must be used with our FPWH-012 fuel pump upgrade harness. Many hangers require our BCWA-FL98HD due to the poor condition of the factory hanger's bulkhead wiring. Please contact your local Racetronix dealer to discuss your fuel requirements. * This kit was engineered for use with the factory Delphi hanger 25027221 / FL0115. We cannot guarantee compatibility with aftermarket hangers. Please submit your VIN number via our contact us form if you are not 100% sure of your application. No returns on open-box pumps. All fuel pumps are voltage sensitive, the lower the voltage the lower the fuel volume. High-performance pumps exhibit a significant increase in fuel volume with increased supply voltage. A high-performance pump's average fuel volume increases over 18% by increasing the supply voltage from 12 to 13.5 volts. The factory harness is marginal at best for supplying a factory pump with enough voltage to perform well. This is why the 'hot wire' modification is so popular. Replacing the factory pump with a high-performance pump can easily double the current demand under W.O.T. pressures. The voltage drop in the factory harness increases proportionally to the current demands of the pump. Racetronix has documented tests where the voltage drop in a factory harness has caused over a 25% drop in fuel pump volume. The Racetronix harness uses heavy 10 gauge copper wire to reduce voltage-drop to very low levels. The factory gauge of wire used is three gauges thinner. Our power feed comes off the back of the alternator where voltage is highest. It then runs through a weatherproof fuse holder and then to the back of the car. The Racetronix harness uses three-position male and female Weatherpack connectors which plug inline with the factory harness at the back of the tank. No cutting or splicing is required. High-quality weatherproof fuse holders and relays are used for maximum reliability. The Racetronix harness has a redundant ground upgrade as it is necessary to improve the harness on the negative side of the pump's supply as well. Racetronix supplies a spare ATM fuse, black vinyl wire ties, silicon grease and mounting hardware with each kit. All Racetronix harnesses are assembled using our computerized crimp-quality monitoring system and then circuit checked for the utmost in reliability. This Racetronix harness is backed by our limited lifetime warranty. A battery to body ground upgrade kit (P/N BGK8) upgrades the under-rated factory ground wire running from the battery to the chassis. It includes an 8 gauge copper wire fitted with terminals and battery nuts with accessory taps. We highly recommend this because this is a weak point in these cars. The Racetronix harness comes equipped with an interface connector just after the relay. This connector in combination with an optionally supplied connector set (P/N PBIC) allows for easy plug and play addition of a pump booster / voltage amplifier such as the MSD or KB units. These voltage amplifiers / boosters will allow the Racetronix single in-tank pump system to support an additional 100-200 flywheel HP (B.S.F.C. dependant) when run at 16-17 volts. This configuration offloads the excessive current draw placed on the factory wiring onto the heavy gauge Racetronix harness system. System diagnosis becomes easier by simply being able to unplug, isolate and bypass sections of the wiring system.